An important feature about our Tongan culture is our value of Tauhi vā (keeping our relations close). However as our extended families grow and move further away it does get harder to keep in touch. It is important to take advantage of the times that families do get together to bond and keep those family ties strong. So here is a great game to connect reminisce and laugh and will defintely bring all generations closer by sharing stories. We gathered for Fathers day and played this last night and there was plenty of laughter and emotional tears at times reminiscing of loved ones not here. And the best part of it all was the younger generation who were glued to their seats listening to all the stories rather than in their rooms on the devices. So when you have a captive audience take advantage of it and tell them all the stories of life in Tonga, explain cultural concepts behind the stories you share. The saying “sai ke tau ʻilo” is a typical saying you will hear often meaning ʻgood to know’ often said in a somewhat sarcastic way. You have to share a story that perhaps no one knows or only a few people know of. It can be of your childhood, a memory of your parents, grandparents. Memories of life in Tonga. A story of a current or past life challenge and how you overcame it. If a quarter of the family eg 3 people already know the story they will call out “sai ke tau ʻilo” then you must share another story. Good for you to start off the game to show the others how it is played. Ensure that everyone shares a story big or small. May take a few rounds for the quiet ones to share but thats ok.
Kuo u loto fiefia ke ‘oatu ‘a e keimi ko eni ma’amoutolu ke mou ngaue’aki ke tokoni ke langa’i ‘etau lea fakafonua’. So excited to offer my first free printable game for you all. 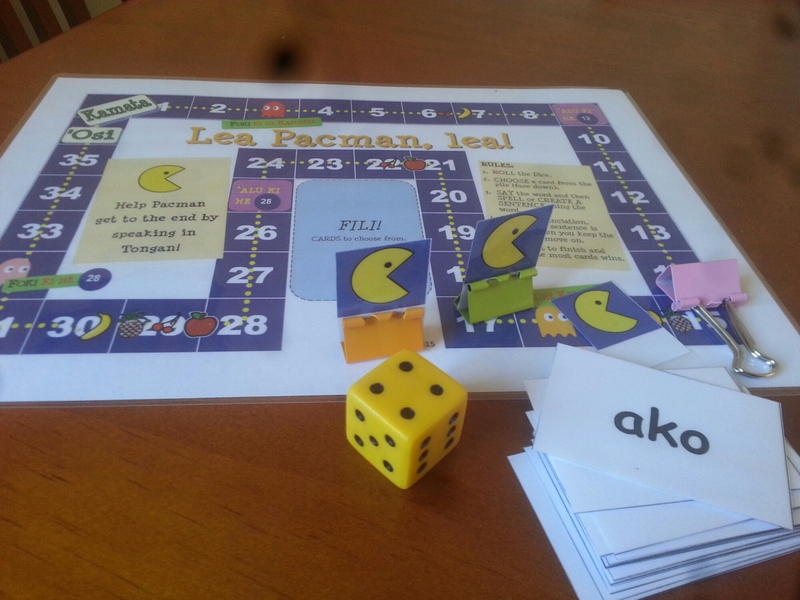 I created this game for my class to have some fun speaking in Tongan. There are 80 sightwords of the most commom words used in my classroom. Please share this post and give me some feedback here, on letslearntongan facebook and or twitter page @letslearntongan. DOWNLOAD THIS GAME AT THE END OF THIS POST. 1. Download and print all the pages. Make sure that the one-sided print setting is on. You can also laminate the pages for durability. 2. 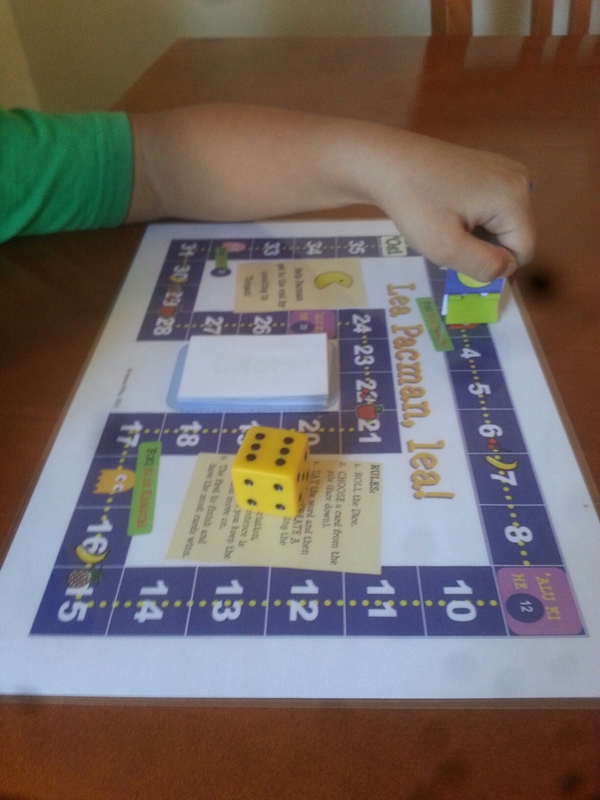 To play the game you need the sightwords, a die, markers and binderclips. Read the second page for directions and how to make the Pacman markers. 3. You are ready to play. Make sure to keep things fun. It’s not about finishing first but the one who collects the most cards by speaking. Say the word correctly and you keep the card. 4. Remember the goal for players is to speak in Tongan. You can vary the game in many ways depending on their ability. If you’re a parent and a native speak get involved and play as well. Pronounce the word correctly. The following can be added as well for more advanced speakers in order to keep their card. Say a synonym for the word. Say an antonym for the word (Some words may not have an opposite word). Game: ko hai au? Who am i? 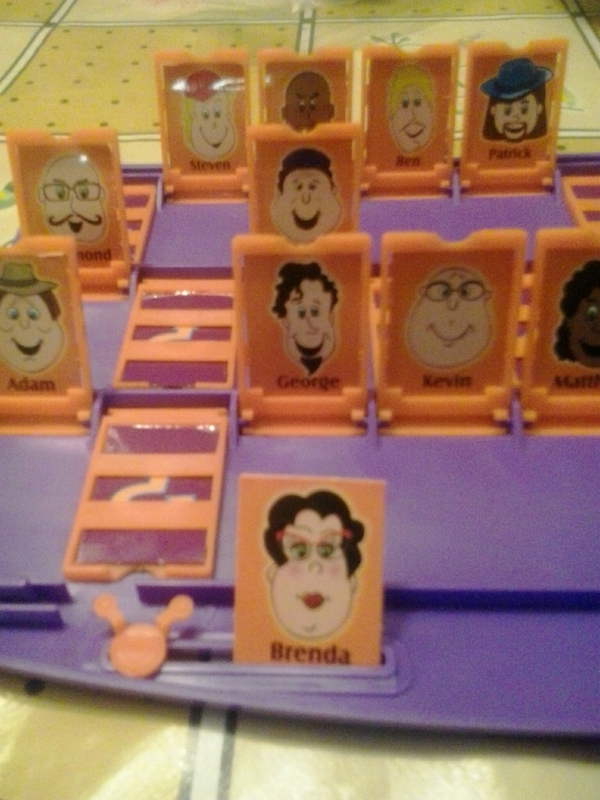 I found this game “who am i” at the flee market last week and my kids and i have been having lots of fun. You ask questions, describing people in Tongan and the other person answers ‘Io pe ‘Ikai – yes or no. Here are some basic questions and vocabulary for you to expand your repetoire. Ko e siana/fefine koe? Are you male/female? ‘Oku’ke tui…. Are/do you wear(ing)…? ‘Oku ‘i ai ha…? Is there a…? Is this useful? Would you like to see something added let me know. ʻOkuʼ ke poto he hikoʼ ? Are you skilled at juggling? ‘Ikai ke poto au he hiko. – No I am not good at juggling. It is an ancient art form of juggling and made into a dance performed by girls only. Any girl who grew up in Tonga would have played endless games with the tuitui nuts that they use to juggle with. The words are old and have lost its meaning but it certainly would have reflected the joyness of playing with ones friends and family. 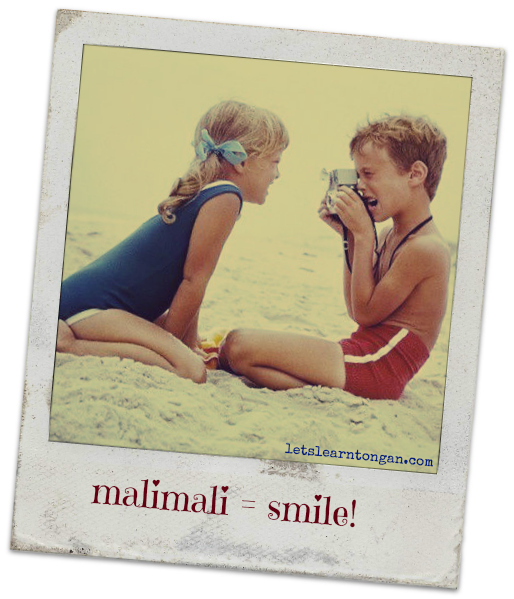 July 7, 2013 9:34 pm / 2 Comments on Malimali means Smile! In anyoneʼs language kids know how to smile and give them a toy camera and they start acting like professional photographers and happily snap away. So this is a great way to teach Tongan to your kids. Not only are they having fun but they are also learning simple phrases. Here are some useful vocabulary when you’re playing imaginary paparazzi and superstar or for real life photo shoots. For Beginners: You could take photos until they get familiar with the phrases. taha ua tolu malimali – 1 2 3 smile! Hanga mai! – Turn this way! Hanga ki hē! – Turn that way! Unu atu! – Move away! Unu mai! – Move closer! Tu’u ma’u! – Stand still! Tangutu ma’u – Sit still! Sio mai! – Look this way! Sio ki ‘olunga – Look up! Sio ki lalo – Look down! Ko ia – that’s it! GAME: Are you ready to go treasure hunting. 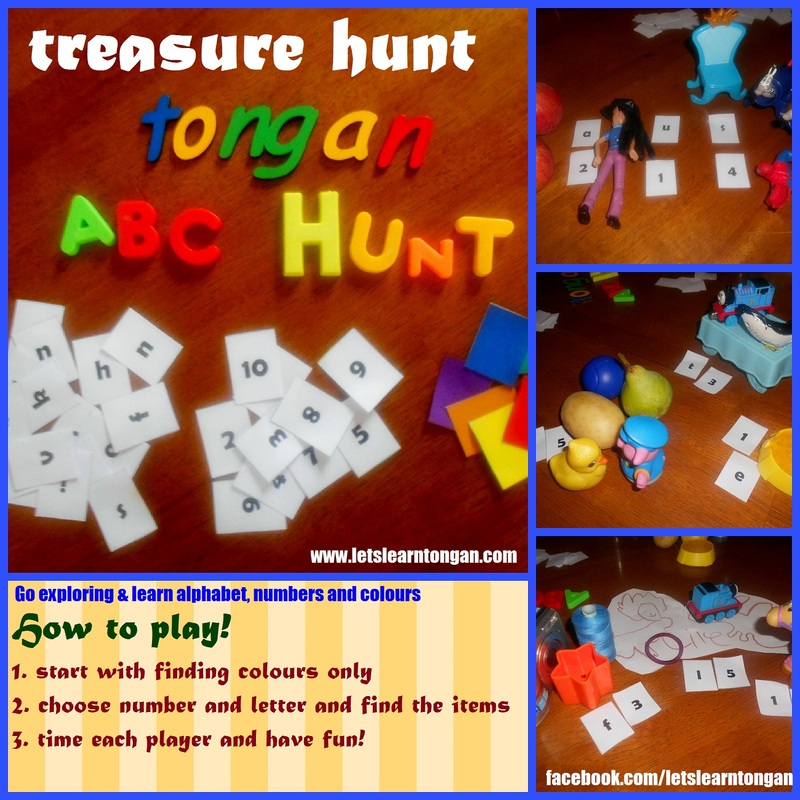 Use the Tongan alphabet, numbers and colours to find the treasure. SUITABLE: Preschoolers, primary (elementary) kids. Beginners for Adults. This is a fun game to play! Get out all your little nick nack toys, and get ready for some fun. 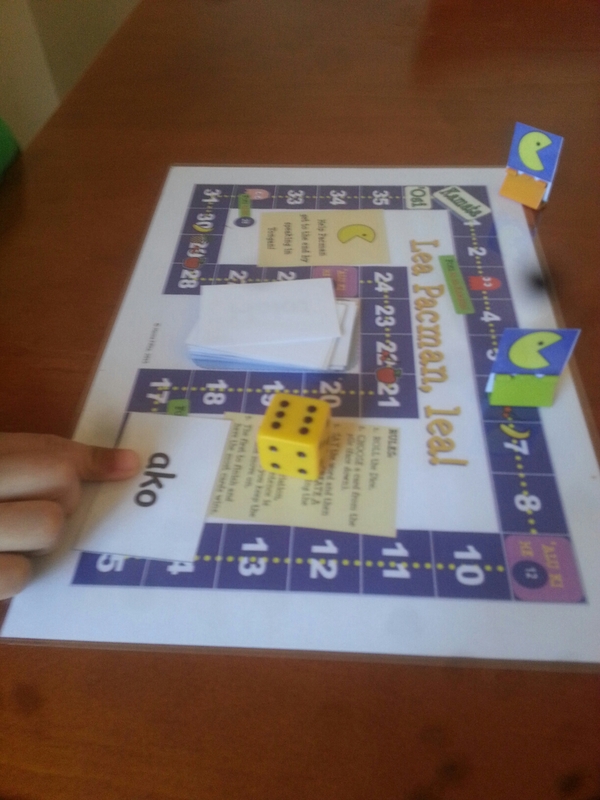 This game can be simplified for preschoolers who are learning their colours and numbers. But it can also be made more challenging for older kids by combining colours, numbers, letters and timing them. I saw this on one of the many kids activity blogs out there and then tried it using our Tongan language. This is by far the best game, according to my 7 year old. She rated it four stars out of five. For younger kids keep it simple. Use the option of 1-5 items max, for older kids you can go up to 10 items. Let your child direct the play. My girl could not find an item starting with ʻlʼ so she came up with the idea to draw the item being a ʻlaioneʼ lion. Be flexible. The word for many foreign things in Tongan start with meʻa (thing) like meʻa vaʻinga (toy) and meʻa faitā (camera). Stick to easier letters. 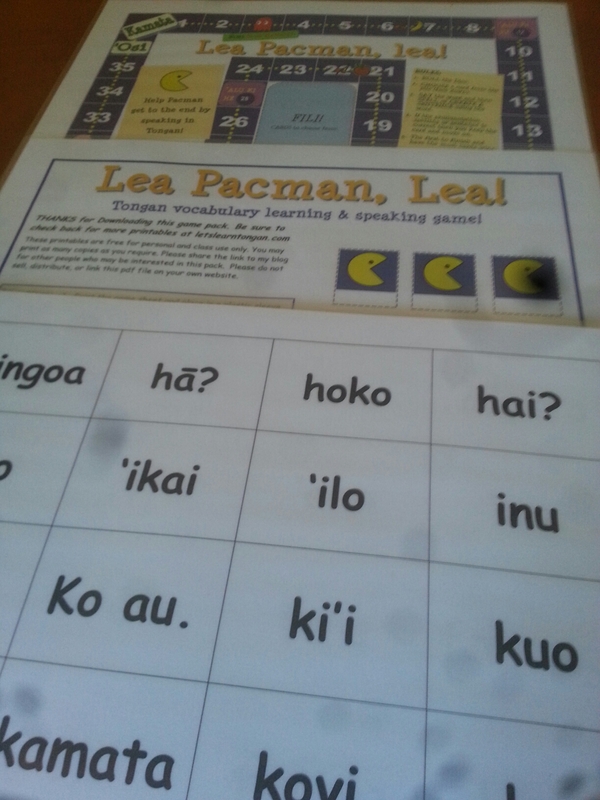 Depending on your vocabulary skill level there will be some letters that will be challenging like ʻeʼ and ʻngʼ. I could not find an item for letter ʻeʼ so i got a yellow (engeenga) item. FOR BEGINNERS! Grab a bowl and collect an item each representing the Alphabet. Then use these items to play treasure hunt. Below are some items that you may have at home in the form of toys, fruits & vegetables and household items. A – ʻĀpele, ʻAngelo, ʻAnga; Apple, Angel or Shark. V – Vesa, Vaʻe, Vai, Vakapuna: Bracelet, Leg (from doll), water, plane. I would love to hear how you guys went with playing this game. Rate it, give me some feedback, did you or your kids enjoy it as much as mine did? Game: how many Tongan words can you make? 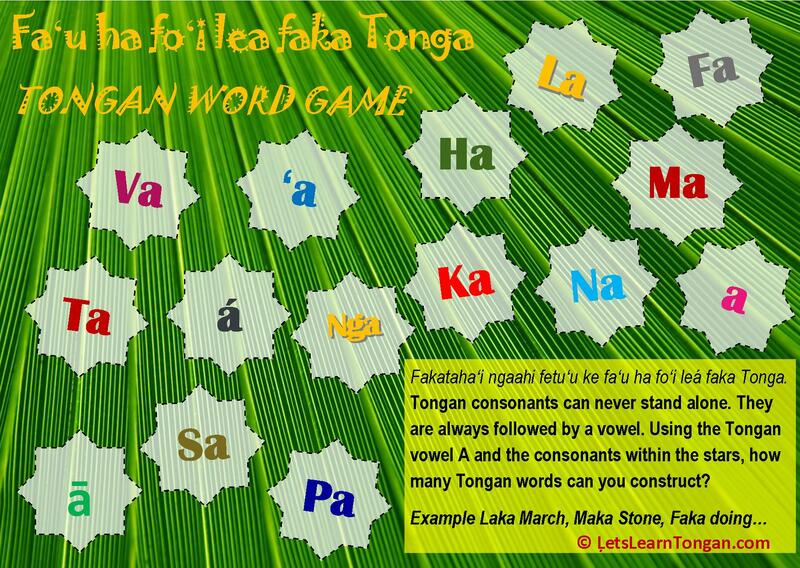 Practice the Tongan sound of the vowel A with this Tongan word game! This is a great game to practice saying the Tongan alphabet and adding to your vocabulary. With this game you will quickly realise that there is only one way to sound out the vowel A. Say A (ah) as in ʻah-huh, A as in ʻA-llah. Ok so how many words did you form? Share your answers so others can add to their vocabulary.